Thinking of attending one of our amazing hot air balloon festivals? This guide is sharing the inside scoop. Here’s what you need to know to get ready. Have you ever wondered what it’s like to fly outside of an airplane? Floating hundreds of feet in the air with the wind in your hair, and the world below you? Well, that’s all possible with hot air balloons. The floating wonders have captivated millions of people for this very reason. If you ever have the chance to ride in a balloon, take it. In fact, if you ever have the chance to visit a hot air balloon festival, take that too. Hot air balloon festivals bring together people who share a love for these beautiful floating orbs and bring them together in one place. The spectacle put on by the dedicated hot air balloon community is something that no one forgets. You haven’t truly seen the sky until you’ve seen it dotted with all manner of unique hot air balloons. Hot air balloons are at their peak in cool, arid conditions with breezy winds. It’s no surprise then, that most hot air balloon festivals take place in the West. Those of us living out West rejoice, but East Coasters might not like this news. Don’t worry, though, between Colorado, Nevada, and Texas there are enough airports to make traveling easy. Here’s a list of hot air balloon festivals worth checking out. This festival is the largest in the country. The Albuquerque International Balloon Fiesta is a 10 day event featuring over 500 balloons. Additional attractions include Sandia Mountain National Park and the Ojo Caliente mineral hot springs. The event, formerly known as the Colorado Balloon Classic, is held annually over Labor Day weekend. Get ready for tons of balloons, live entertainment, and balloon rides. This year marks the 40th anniversary of the Great Texas Balloon Race, so come prepared for an extra special year. Competitive pilots from around the world gather to race for victory. The Great Reno Balloon Race mixes family fun with friendly competition as pilots compete in a number of unique events. Make sure to take the kids on a tethered balloon ride. Any of these events are a great introduction into the world of hot air balloon festivals. Each offers family friendly fun that you’ll never forget. Now that we’ve established where you can find these hot air balloon festivals, we need to break down what you should actually do once you arrive. Yes, you look at hot air balloons. We know that’s the obvious answer that most of you are probably thinking. However, there’s so much more to these festivals than just watching the balloons soar. Most hot air balloon festivals have an event called the “Dawn Patrol.” This “patrol” sets off before daybreak to measure the prevailing winds and air density. These balloons make for an excellent spectacle if you’re willing to wake up early enough to catch them in flight. Their silhouette over the grounds while the sun rises provide the opportunity for great photographs. Plus, getting to the festival early ensures you’ll have an easier time getting finding seating for the rest of the day. That, and you can enjoy the first round of balloons without the crowds. If you’re looking to get a close-up view of your favorite hot air balloons, you’ll want to check out the Balloon Glow event. Held in the evening and into the night, Balloon Glow is when pilots tether their balloon very close to the ground and ignite their burners. The result is a field full of swaying, brilliantly lit balloons of all kinds that are close enough to reach out and touch. Balloon teams also affix baseball styled cards to their baskets, or simply hand them out, to spectators. The cards detail vital statistics like balloon age, weight, team size, and home state. Many people walk from balloon to balloon, collecting each card and saving them as a free commemoration of the event. Could you really hold a hot air balloon festival without offering balloon rides? Of course, not! If you’re the competitive type then make sure to attend the key grab. During this event balloon team’s first must judge the wind speed and direction of a pole planted at random in the festival grounds. Atop the pole is the prize, usually a key to a car or money in an envelope, that teams collect to win the event. Competitors then leave the event and launch their balloons from a distant location. The first team to maneuver their balloon and grab the key wins! Yes, this event is exactly what it sounds like. The mass ascension is when every balloon in the festival simultaneously launches into the air. Balloons of all shapes and sizes rise up into the sky, stretching far and wide. There’s nothing more spectacular than hundreds of balloons blotting out the sun. Expect a rainbow of different colors, and balloons of all different shapes and sizes. We’ve seen everything from your traditional balloons to Spongebob Squarepants flying high overhead. If we could only choose one event to visit, we’d choose the mass ascension every time. 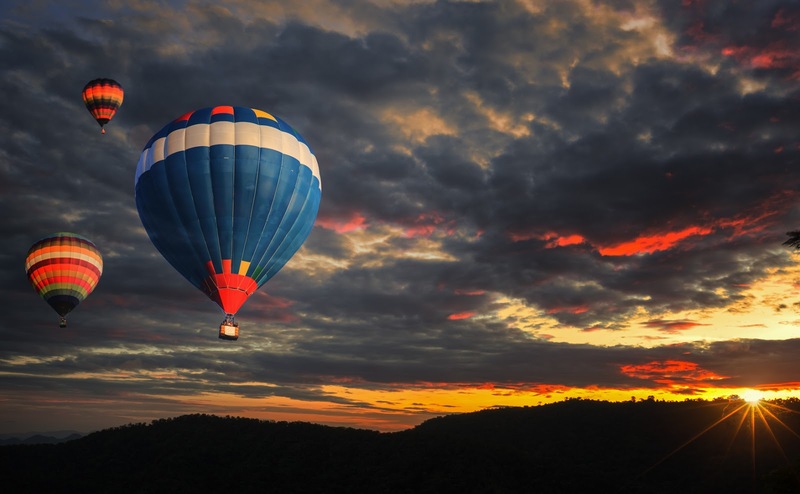 Hopefully, this guide has piqued your interest about the world of hot air balloons. We’re an interesting bunch, but always welcoming of newcomers. Our yearly festivals are just another way for us to say hello and bring joy to someone’s life. We’re looking forward to winter’s end so we can get our balloons in the air again. The next round of festivals is this summer, and we hope to see all of you there. Remember, you haven’t truly seen the sky until you’ve seen it outlined with hot air balloons. Previous PostPrevious What Do Hot Air Balloon Rides Actually Feel Like?